Did you hear about Israeli Prime Minister Netanyahu’s revelation that Iran is cheating on the deal it made in 2015 with six major world powers? Well, if you did, you misheard. Or were misled. The statement’s “clerical error,” in the words of White House spokesperson Sarah Huckabee Sanders, was later amended, with “has” changed to “had.” How tragically droll had World War III resulted from a single letter typo. What Mr. Netanyahu in fact revealed was a large cache of documents (55,000 pages, and 183 compact discs) that, he explained, had been obtained and spirited out of Iran by Mossad (that grinding sound you’ve been hearing is the manic gnashing of mullahs’ teeth). The voluminous material, as described by the Israeli leader, revealed some previously unknown former Iranian nuclear sites, and showed that Iran, despite its insistence to the contrary at the time the Joint Comprehensive Plan of Action was enacted, had indeed earlier pursued the manufacture of nuclear weapons. That revelation is less than shocking. Nobody, including in the Obama administration, believed that Iran hadn’t aspired to nuclear weaponhood. The Shiite government was known to have had a program, “Project Amad,” with that specific aim, which continued until 2003. President Trump campaigned on a promise to trash or renegotiate that “worst deal ever” (an appellation it apparently shares with NAFTA – they must have tied for first place), and has now pulled the United States out of the agreement. Some observers have speculated that Mr. Netanyahu’s dramatic unveiling (quite literally; he pulled a curtain off exhibits) of the material taken from Iran and demonstrating the country’s deceitfulness was intended to prepare the way for Mr. Trump’s pulling the U.S. out of the deal. 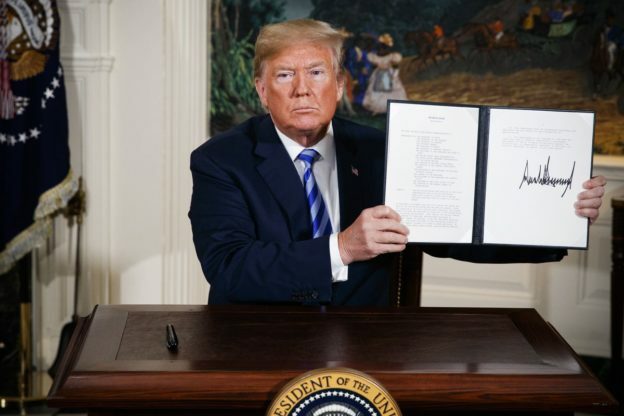 But the revelation might also have been aimed more poignantly at the Iranians themselves, to put them on uncomfortable notice that not only is what everyone knew but couldn’t prove in 2015 now proven, but also to apprise them that Israel has the means to infiltrate secure locations within Iran (even within Tehran, where the documents had been hidden) and help itself to what it likes. What’s more, the president’s bravado – or, in his critics’ eyes, volatility – arguably helped intimidate North Korea, even though the outcome of that country’s inscrutable leader’s overture to his southern neighbor remains to be seen. Might Mr. Trump’s swagger (which his new Secretary of State Mike Pompeo has declared is returning to American foreign policy) convince Iran to better… understand things? President Emmanuel Macron of France, Chancellor Angela Merkel of Germany and Prime Minister Theresa May of Britain futilely lobbied Mr. Trump to not re-open the deal. Iranian hardliners are clamoring for Iran to abandon the deal itself and resume its nuclear program. But the nation’s mullahcracy certainly appreciates the deal’s lifting of some economic sanctions. Might it conceivably accept tightened terms if some means can be devised to allow it to save face? Neither reasonability nor flexibility, though, are among the current Iranian government’s strong points, and even if a typo, thankfully, didn’t result in war, pushing the mullahs too far could. Let’s hope – and be mispallel – that it won’t. This entry was posted in News, Politics on May 10, 2018 by Rabbi Avi Shafran.